I got one of these Adafruit 8x5 NeoPixel LED panels with a grid of WS2812 LED's and decided to make some control circuit for it with an ATtiny85. The idea being a computer (PC or Raspberry Pi, etc) could send commands over a UART to the ATtiny85 and the ATtiny85 could control the color on the LED's. Since the ATtiny85 doesn't have a hardware UART, I started by getting a software UART I made for another project to work at 20MHz and 9600 baud on this chip. I then wrote the code to send the first 120 bytes of the ATtiny85's RAM to the string of WS2812 LED's. The concept (and programming) is pretty simple. The data line is kept low until data is to be sent at which time it sends a sequence of keeping the line high for either 0.35uS or 0.7uS depending on if it's a zero or a one and then keeping the line low for 0.8uS or 0.6uS depending on if it's a zero or one. The on time makes sense to me, but the off time looks like an error in the datasheet or something (which wouldn't suprise me.. I think whoever wrote this awful datasheet must have been drunk). After the line is kept low for at least 50uS the bitstream from the micro is considered done. The bit stream itself is 8 bits green, 8 bits red, 8 bits blue starting at the first LED. So if I want to set LED 0 to (0,255,0) and LED 1 to (255,0,0) I would send 6 bytes of: 0, 255, 0, 255, 0, 0. 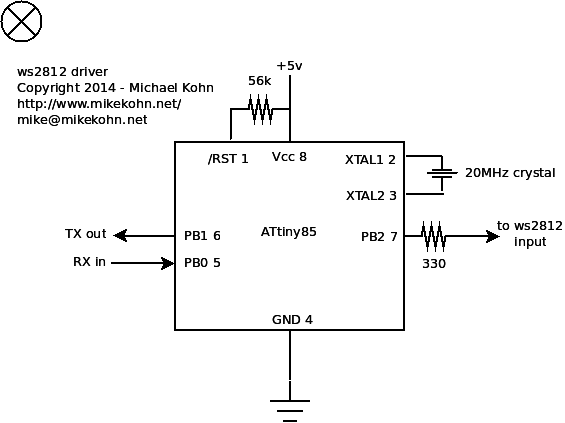 So basically all of the commands above simply modify the RAM in the ATtiny85. When the user wants to display what's in RAM the 0xff 0xff command is sent to the chip. This way the user can draw multiple pixels in RAM and not have to worry about the ATtiny85 being refreshing the LED string until the user is ready. So for example, I could send over the UART: 3, 255, 0, 0 which would set pixel 3 to red in RAM, but not show up on the LED's yet. Then I could do 0xff, 0xfa and pixels will shift right in RAM (so pixel 3 is off and pixel 4 is on). Still nothing shows up on the LED's until I send 0xff 0xff.